When Sarah dropped out of school in the 11th grade, she didn’t realize what an impact it would have on her future. She had a hard time finding a job that would hire her and would also bring in enough money for her to support herself. Sarah was living at her parents’ house without a job when a friend told her about HRDC’s Alternative Education program, where she could earn her High School Equivalency Certificate at her own pace. She felt that the program would offer her a new beginning and better opportunities, so she enrolled. Immediately, she began to feel better about herself. “The program made me realize there are second chances,” said Sarah. 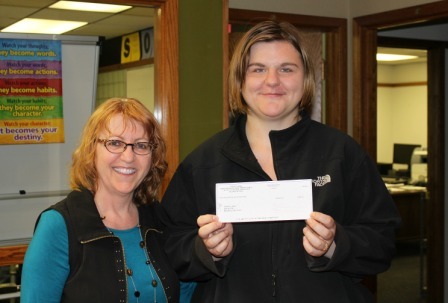 Sarah began to set goals for herself, the first being to receive her HiSET (High School Equivalency) Certificate. She was referred to HRDC’s Youth Employment program and with her case manager’s help she worked on job readiness skills which allowed her to find work while she was completing her education. She admits there were times when her enthusiasm dwindled, but she credited her teacher Penny with motivating her by calling frequently and making sure she was doing well. After 14 months Sarah was able to reach her goal, and on May 13th, 2015, she graduated with her High School Equivalency Certificate. “I am so proud of Sarah,’ said Penny, ‘She overcame personal struggles and pressed on. It was such a joy to see her walk across the platform to receive her HiSET Certificate.” Sarah is eager to start her next goal of becoming a pre-school teacher and will be meeting with an admissions counselor at MSU-B to enroll in their Early Childhood Development program. It was a goal she never saw herself achieving before she began the program, but now that she has the tools to go after what she had been dreaming of doing, she knows she will be successful.